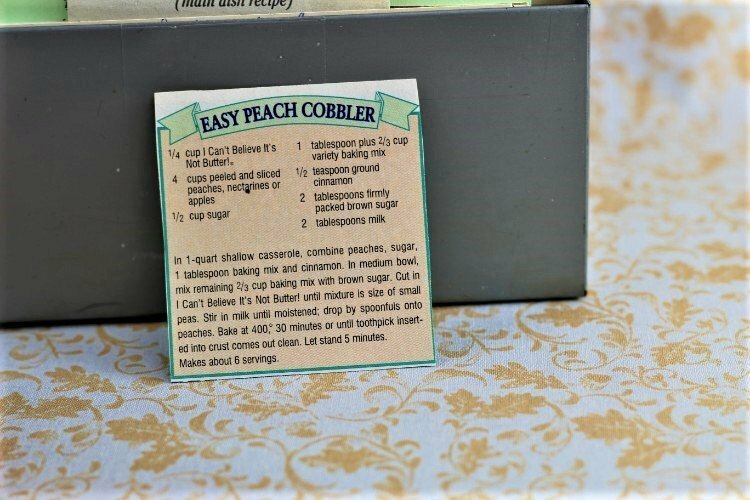 Front of the recipe card for Easy Peach Cobbler. 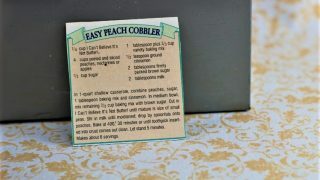 There are lots of fun recipes to read in the box this recipe for Easy Peach Cobbler was with. Use the links below to view other recipes similar to this Easy Peach Cobbler recipe. If you make this Easy Peach Cobbler recipe, please share your photos and comments below! ¼ cup I Can't Belive It's Not Butter! In 1-quart shallow casserole, combine peaches, sugar, 1 tablespoon baking mix and cinnamon. In medium bowl, mix remaining 2/3 cup baking mix with brown sugar. Cut in I Can't Believe It's Not Butter! until mixture is size of small peas. Stir in milk until moistened; drop by spoonfuls onto peaches. Bake at 400°, 30 minutes or until toothpick inserted into crust comes out clean.